A public hearing on Nestle's permit request. The Michigan DEQ has approved a permit from Nestle Waters North America to increase the amount of groundwater it pumps from its well near Evart, Michigan. The state says Nestle has to complete a monitoring plan and submit it to the DEQ for approval. After that happens, Nestle will be authorized to pump up to 400 gallons of water per minute from its White Pine Springs well. The permit request was highly controversial. 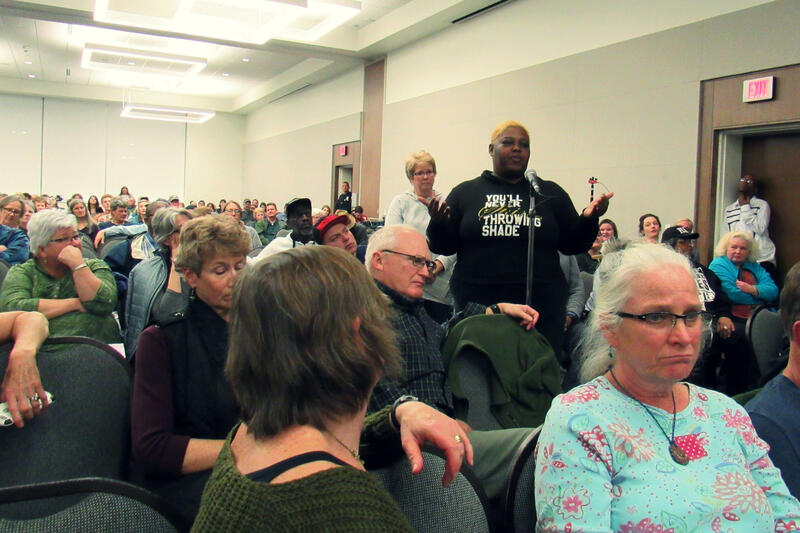 As Michigan Radio's Lindsey Smith reported, the DEQ received a unprecedented number of public comments on Nestle's proposal. 80,945 commenters were against the request. 75 were in favor. “This is a 60 percent increase in the volume extracted -- potential 60 percent increase -- and it’s just tough to take,” said Nicholas Occhipinti, government affairs director for the Michigan League of Conservation Voters. In a press release, MDEQ director Heidi Grether stated, “In full transparency, [the] majority of the public comments received were in opposition of the permit, but most of them related to issues of public policy which are not, and should not be, part of an administrative permit decision. We cannot base our decisions on public opinion because our department is required to follow the rule of law when making determinations." The DEQ says Nestle's permit "meets the requirements for approval under Section 17 of the Michigan Safe Drinking Water Act, 1976 PA 399, as amended (Act 399), which is required to produce bottled drinking water if the water is from a new or increased large-quantity withdrawal of more than 200,000 gallons of water per day from the waters of the state." 80,945 against to 75 in favor. These numbers show the scope of the public opposition to a new proposal from Nestle. The company wants to be able to pump a lot more water out of the ground in West Michigan that it can bottle and sell under its Ice Mountain brand. Nestle manager joins board that can rewrite environmental laws in Maine. Could this happen in Mich.? The Michigan Legislature is considering three bills that would change how the state determines environmental rules. One of the bills would create an environmental rules committee that could reject or change any rule the Michigan Department of Environmental Quality issues. Nestle Waters North America sued after Osceola Township rejected a zoning permit. Nestle wants to withdraw up to 400 gallons a minute, with help from a pipeline booster station at the SpringHill summer camp.